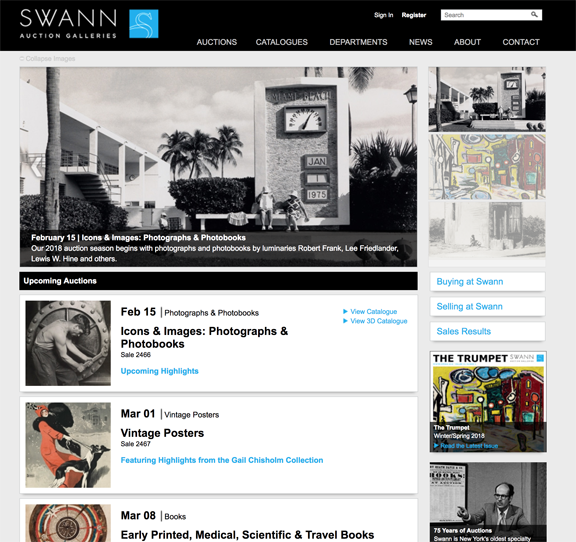 Swann Auction Galleries, twice a year, sends to its mailing list The Trumpet, it’s announcement of upcoming sales. The recent issue, Volume 32, Number 2, provides a clear picture of a firm in mid-stride, long important in the book, manuscript, map and ephemera fields, now releasing a robust schedule of events that will appeal to buyers across the spectrum. It’s an important site to follow.